I'm amazed this thread is still going by now; clearance at my Targets have been dead for months if not well over a year now. Just had the best Target clearance deal I've had in a little while. Got the last copy of Attack on Titan 2 (Switch) for $17.98 at the local store. It was still marked $41.98 so that is possibly why it was still there. Considering it seems to be sold out at a lot of retailers I am happy with this purchase! They also had Beast Quest (PS4) for $5.98 which I would have picked up if I didn't already have it. So how is Beast Quest? Basically the next season of the show/series doesn't translate well into gameplay to make a whole game, so this version is the second game with the DLC that is being released. I honestly can't answer because I grabbed one as a future gift and flipped the other for $9.60 at GS. 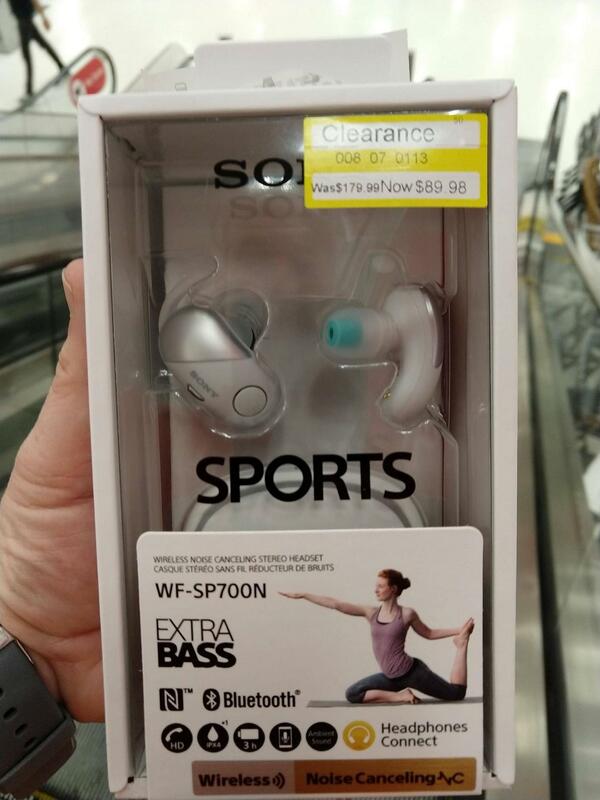 Also..found these Sony earbuds today at 50% off. I show two stores in my area with that price but the one I saw them in was the only one with stock. It is going through a remodel so that might explain the early clearance on it. My local store must have done a send back yesterday or today. There were multiple end caps full of electronics items charges, Apple Watch bands and accessories, phone cases over the weekend. There were mostly empty pegs and scraps. Like the other person I flipped them at GS, but had to wait a day between so I played it for a half hour or so. The game is rough. Real bad chunky frame rate, controls that feel floaty and unresponsive. Seems like the story may be okay but nothing about it seems special enough to put up with whats wrong with it. All in all It's a real bad port of a mobile game. If you have any interest in it, it sounds like mobile would be the place to play it. I checked gameplay footage on youtube, it looks awful. Probably a budget game but the real question is how’s the achievements. Easy? I bought the last copy of Attack on Titan 2 for ps4 within 20 miles. Love the adventure time game. Good rpg. Is it true it's too childish and easy? Similar to South Park and turn based. It was free last month for Xbox live gold games. My local Target has a 'repackage' Xenoblade Chronicles 2 Special Edition for $49 (50% off) and with a slightly dented box. I've never played any of the series. Does this have resale value, or is this game a must buy? A lot of people really love Xenoblade Chronicles 2. I personally couldn't get into it, but pretty sure the resale value on the SE is more than $49, not sure if it's enough to be worth flipping it though. Must Buy IMO. I liked XC1, but it wasn't anything remarkable for me. XC2 on the other hand, is one of the best RPGs I've ever played. It's deeply complex in terms of technical gameplay, has a great story, fun battle mechanics and I find the characters to be likable & endearing, in most cases. Surprisingly, Torna: The Golden Country does even better because it has revised battle mechanics and since its "DLC," it could really be considered a standalone game, and a tight, focused story. Highly suggest picking up both. Don't think the Collector's Edition has a great deal of resale value at this juncture. Not sure if these have been mentioned but saw these 2 Pixel Pals on the clearance rack tonight. I bought several of these back when Amazon warehouse deals had this for about the same (maybe up to $60). I ended up selling the individual pieces for profit until I got a truly "like new" edition to my liking. You may want to look into selling the cartridge, steelbook, art book, and audio CD separately if you are interested in only one part of it. Aside from value in the sense of market value, the game was great for me. I think I have over 200 hours in it. Just went into Target and found StarLink packs on clearance for 50% off, and an additional 50% off cartwheel coupon. Got two of the big ship expansions for $6 each and the smaller figure pack for $2. Picked up dynasty warrior and vampyr. Adventure time $8.98 sold out. Went last night and picked up the last copy of Attack on Titan 2 within 90 miles of me. Thanks for the heads up! Only other clearance I saw was Farming Simulator 17 Platinum Edition (PS4) for $14.98. Not a single copy of farming simulator at my store. Picked up one of these. Figured it would be worth it for the Rasberry Pi. got the number to look this up?